Mandas Disney Blog: Johnny Depp signs on for Pirates 5!? There's conflicting reports all over the internet this morning about Johnny Depp and Pirates 5! Some say he's signed on ... some say he's still in negotiations ... but I'm going with the story that he's signed on simply because that's the one I want to believe!! lol! I love love LOVE! the pirates movies!! So I can't wait for this news to be confirmed! I wonder what Jack will get up to this time! :P But whatever it is I'm sure Disney have something awesome in store! Will Turner is dishy also ... more in the 2nd and 3rd film though than the 1st! lol! That's exactly the same as me! When he came back up from the ocean I was like OH HALLO THERE! lol! Great story. 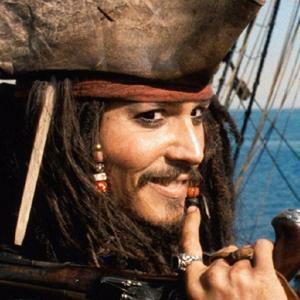 I would love another Pirates, Johnny is so great as captain Jack. Hope to hear soon about it..